Soviet Comedy – The Future of Comedy? As you know, Twitter has reared its ugly head in comedy. For an example, Kevin Hart — and, look, I have to profess a certain degree of ignorance. I’m not up on the latest stand-up comics. I haven’t seen a comedy movie in a long time. So it’s one of those areas that I have allowed to pass me by. So I heard that Kevin Hart, a black stand-up comedian and occasional actor was going to guest host or emcee the Oscars, and then “Twitter blew up.” Twitter blew up. Who the hell is Twitter? … some years ago had tried to say funny things about gays and lesbians and transgenders. So Twitter blows up. The Drive-By Media starts reporting what Twitter’s blowing up over it, and the next thing you know, the Academy is telling Kevin Hart to get lost. We don’t want you here. Screw you, buddy! We can’t afford to have your baggage at the Academy Awards. So he’s out, and they can’t find anyone. So this keeps happening. It keeps happening to one comedian after another. Unless the comedian is an unfunny, hate-filled, left-wing, wacko who does nothing but hate conservatism. 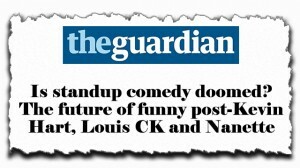 That is the only kind of comedian that qualifies these days. So late-night comedies are not comedy shows anymore. They’re nothing more than extensions of the Democrat Party and the media’s left-wing activism. And the one thing about comedy is, it isn’t funny anymore. Comedy now elicits political cheers rather than laughs. Here’s the open or the lede to the piece. It’s written by… I don’t care who wrote it. Doesn’t matter. “Comedy is in a period of extraordinary flux. The past two years have witnessed the reputations of revered comics, such as Louis C.K. and Aziz Ansari, implode in the wake of #MeToo allegations. 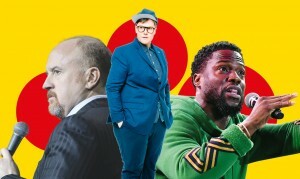 Then there is the culture of unearthing old tweets, with standups being held to account for problematic ‘jokes’ they’ve made online (for Kevin Hart, it even cost him his most high-profile gig to date, hosting the Oscars). There are also increasing fears around political comedy and censorship. Elsewhere, Jim Davidson, a man once so vile he was almost immune to judgment, was reported for hate speech, at his own birthday party no less… The comedy goalposts are shifting and there is a demand that the art form gets more socially conscious. “But can you be woke and funny? And are we living in a time of such change and heightened awareness that the two can now never be mutually exclusive?” Meaning, can you be politically correct — can you get the approval of madcap, leftist sensors — and be funny at the same time? I’m here to tell you, you can’t. “Is this the future of [funny]? Perhaps it is the only way to survive. Comic Dane Baptiste thinks it could be detrimental to a comic’s career to plough on with problematic humor: ‘It’s not an obligation for comedians to be socially aware in their narrative but I feel that if you have no commentary on the mechanics that affect your life and lives of others, you might find yourself rather detached, and eventually irrelevant.’ When it comes to how people balance freedom of speech versus social responsibility in their comedy, there is, perhaps, a generational divide.